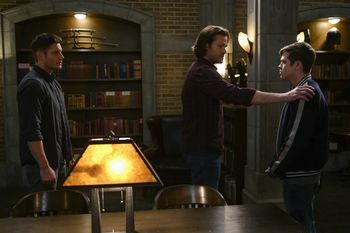 Synopsis: Jack desperately tries to undo his actions, while the Winchesters and Cas desperately search for him and Mary. Addresses for cast and crew. Please be aware if you don't instruct couriers you will cover customs/duty on shipments the studio in Vancouver can't accept delivery. Things to do: A list of entries that need updating! Content Notes: This entry endeavors to provide some information on the content of Supernatural episodes and this website, that can be used to assist fans in curating their experience of the Show and our fandom, and the Supernatural Wiki. This list is by no means exhaustive. For a guide to the social media accounts for the cast, crew and people associated with Supernatural, as well as major media and fansites see our Social Media Directory. Any fan is welcome to join the Supernatural Wiki - just email Jules, the Supernatural Wiki Managing Editor on admin@supernaturalwiki.com to get an account created, or with any queries or suggestions for the site.. The SupernaturalWiki is run by fans, for fans. We do not accept advertising. The web hosting fees and technical support for the SuperWiki are supported by donations from fans. DONATE HERE and be assured that 100% of the money you give goes directly into SuperWiki running costs. Material on this site is licensed under a Creative Commons Attribution-NonCommercial License. Training programs for those affected by cyberbullying. CLICK THROUGH HERE FOR SUPPORT OR MORE INFORMATION. 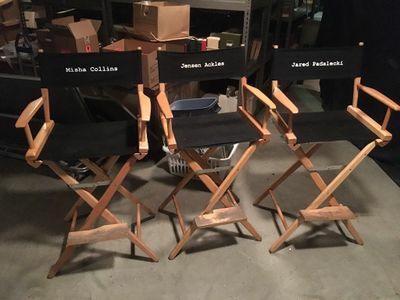 Executive Producer Jim Michaels posted this photo with the comment "It is going to be a sad day next season for me when I know none of these people will be sitting in these chairs later in the day— "
For all the Supernatural and fandom news as it happens follow us on Twitter @SuperWiki. "We just told the crew that though we’re very very excited about moving into our 15th season, it will be our last. Fifteen years of a show that has certainly changed my life, I know it’s changed these two guys’ life. And we just wanted you to hear from us that though we’re excited about next year, it will be the finale. The big, grand finale of an institution," Ackles said. 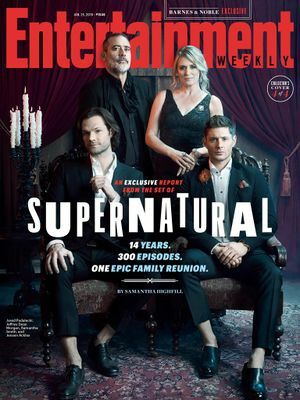 "I will say this, a little word from Eric Kripke, the creator about this world and these characters, that in a show about family, it is amazing and it is the pride of his life that it became a family. So thank you guys for that." Jensen on his Instagram post: "Well, it’s official. One more round for the Winchester brothers. Though nothing ever really ends in Supernatural...does it?" Jared on his Instagram post: "Dear #spnfamily, Season 1 @jensenackles and I want you to know that next season, SEASON 15, will be the last season of #supernatural. I am so incredibly grateful for the family that we’ve all built together. I love y’all and am more appreciative of y’all than my meager vocabulary could hope to describe. I’m also typing through tears. So, please forgive me. ‘Til next time. #WinchestersNeverDie"
Misha on his Instagram post: It’s been a hell of a run, and we couldn’t be more grateful for all of it. No matter what, we’ll always all be ‪#SPNFamily‬. Both Danneel Ackles and Genevieve Padalecki also both posted on Instagram about their connection and love for Supernatural. On 29th March, Misha emailed GISHers and posted on Twitter, a letter about the ending of Supernatural. On his Instagram post, Jensen commented "Brothers for life". Stay up-to-date with all the Supernatural news with the Route 66 newsletter, delivered to your inbox every two weeks. Sign up here. Brianna Buckmaster is nominated for a Leo award for Best Guest Performance by a Female in a Dramatic Series for her performance as Sheriff Donna Hanscum in 13.11 Breakdown. The winners will be announced on June 1st, 2019. Actress Danielle Savre talks about her experience on Supernatural changed her perspective on acting by Digital Spy. On 3rd March, Jensen reigned as 51st King of Bacchus on 3 March with the New Orleans krewe for its 2019 Mardi Gras Carnival parade! Check out our entry for all the coverage. Jensen is in the voice cast for an animated film based on the Batman: The Long Halloween comics. The Ackles' home in Austin has been featured in Architectural Digest. There is also a wonderful ten minute video tour thought the house with Jensen and Danneel. 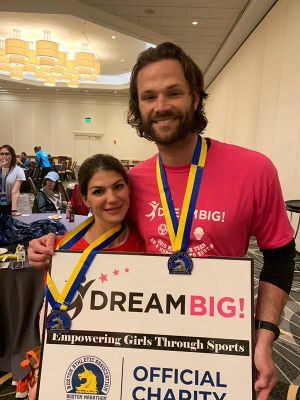 Jared and Genevieve completed the Boston Marathon and raised over $30,000 for Dream Big! is an organisation that supports low income girls in being involved in sports and physical activity. Funds were also rasied thru sales of a "Run Pads Run" t-shirt thru Stands. Check out all the Charity T-shirt Campaigns and how many shirts have been sold. Read about the history and success of the Always Keep Fighting Campaign and The Pack Fund. Jason Manns interview with Nerds and Beyond. Check out our Salute to Supernatural Chicago 2019 for all the coverage from the Con. All the upcoming Supernatural conventions are listed on our Convention Calendar. Hollywood Collectors Convention at Tokyo, Japan: Mark Pellegrino, Alaina Huffman, Jim Beaver and Sebastian Roche. "Lessons learned, one con at a time!" "Conventional Wisdom" is a collection of stories about the impact of conventions. You can buy it here. Fan Archive Archive of our Own has been nominated for a Hugo award! Details of a court case where an author was charged with plagarism when another writer claimed to have invented the Omegaverse aka A/B/O fic. You can read a legal analysis of the lawsuit here. Looking for a Supernatural fanfic or art challenge to take part in our read? Then check out this amazing database of over 90 Big Bangs and over 160 other types of challenges compiled by Alyndra ! "The Wayward Project" is a fanfic virtual season of Wayward Sisters. The Road So Far is an Archive of over 13,000 Supernatural fan artworks, collecting the incredible and diverse works of both active and deactivated artists from the fandom in one blog as a time capsule of talent. Posting is now on for the Supernatural Spring Fling Fic & Art Exchange featuring lots of wonderful stories and art including a wide range of pairings and gen.
Masterpost of art and novella and novel length stories in the 12th Annual Supernatural and J2 Big Bang Challenge. This page was last edited on 25 April 2019, at 09:33.